Detectives with the Anaheim Police Department and Orange County Sheriff's Department investigate a pipe bomb explosion on North Anaheim Boulevard on Sunday, March 27, 2016. ANAHEIM, Calif. (KABC) -- A pipe bomb exploded in an Anaheim neighborhood, shaking nearby homes and businesses on Easter. 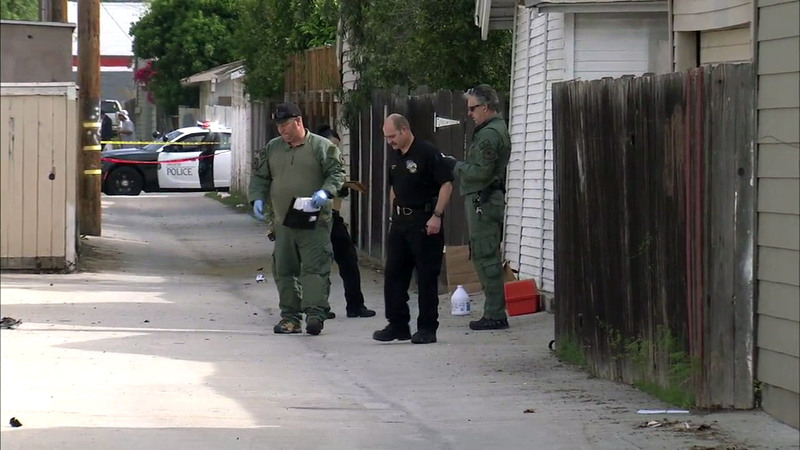 Anaheim police said the metal pipe bomb went off in an alleyway in the 600 block of North Anaheim Boulevard at about 2 p.m. The explosive device was placed against the wall of a closed business, causing some damage to the building, according to authorities. The fence of a home was also damaged by the blast. Officials said it's not known if anyone was inside the building at the time of the explosion, but said no one was injured from the blast. Anaheim police and the Orange County Sheriff's Department were at the scene. Officials said their investigation is ongoing.